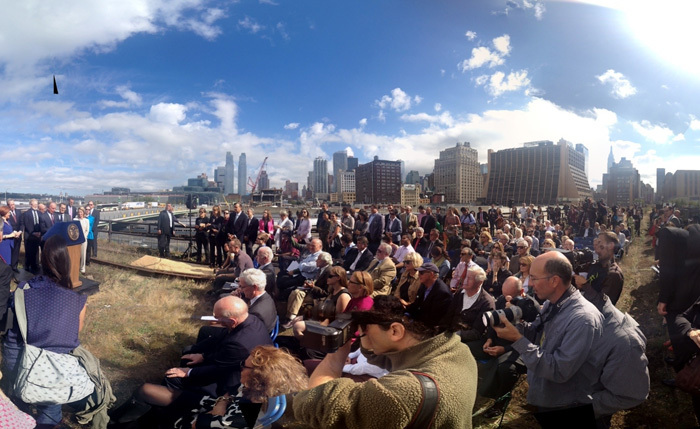 Groundbreaking at the High Line at the Rail Yards! 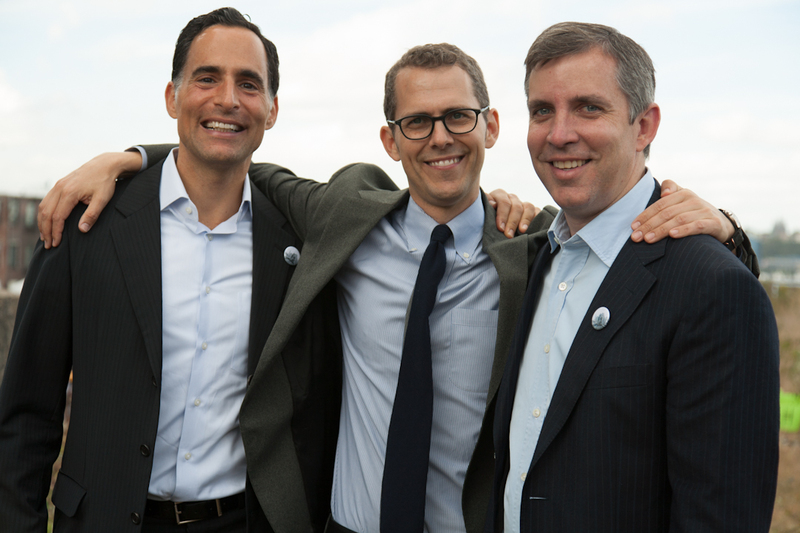 Earlier today we celebrated an incredible moment in the history of the High Line. 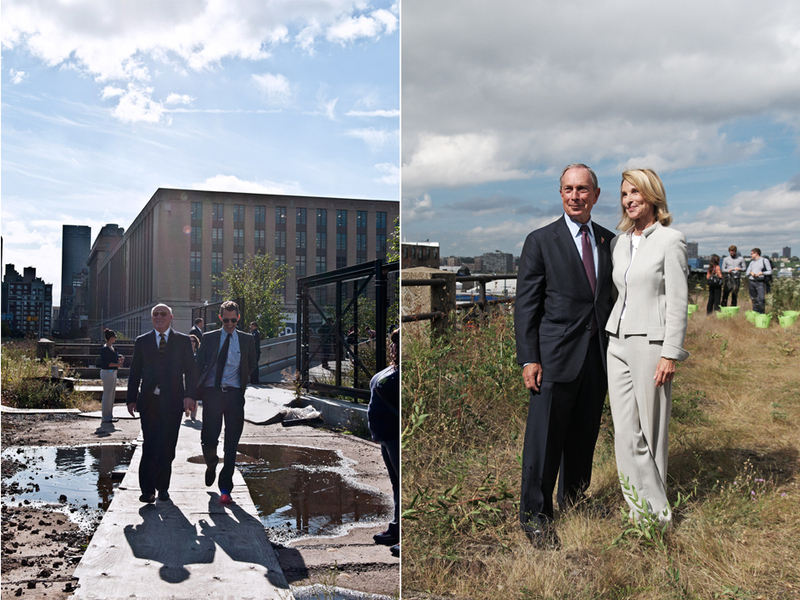 We joined a small group of elected officials, supporters, and friends for a ceremonial groundbreaking on the third and final section of the High Line at the Rail Yards. Follow us after the jump to see photos, design renderings, and learn more. 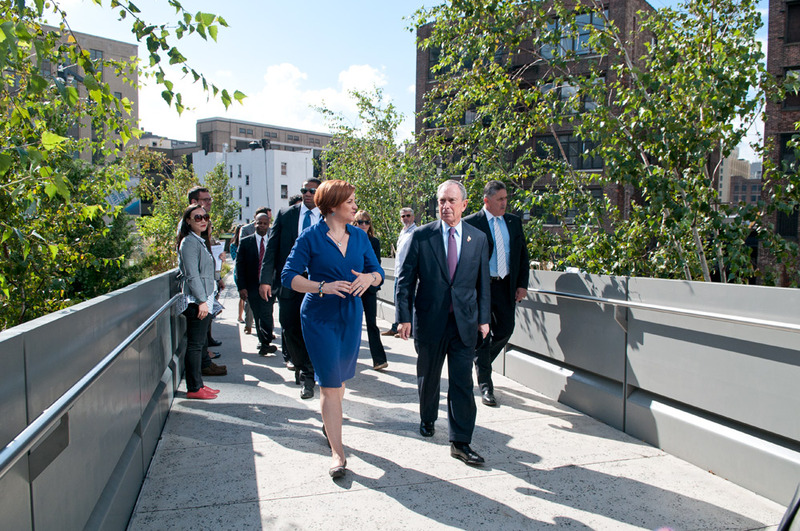 At 10:00 AM this morning, Mayor Michael R. Bloomberg and New York City Council Speaker Christine C. Quinn joined us to hold a press conference to mark the beginning of construction on the third and final section of the High Line. It was a ceremonial moment – the official construction won’t get underway until next month. Nevertheless, today was a day for celebration. 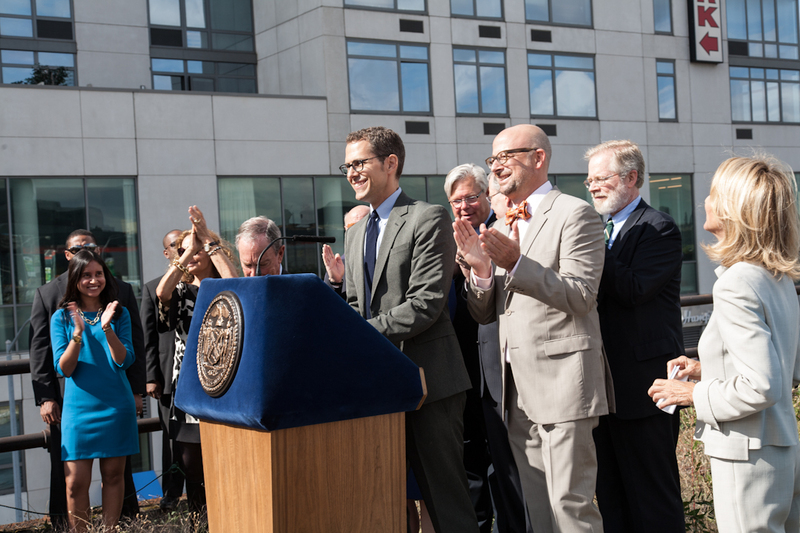 It marks a new high point in the 13 years of advocacy for the High Line, as we take the first step towards completing the final section of the High Line. Work will proceed in three phases, with the first phase projected to open in 2014, extending the park to the northern terminus of the elevated rail structure at West 34th Street. 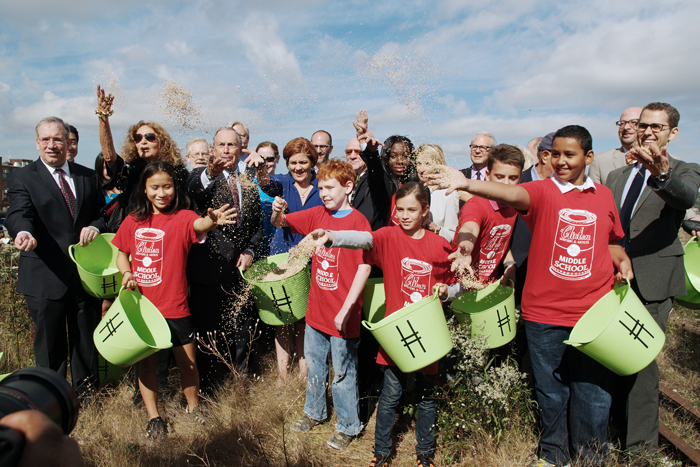 As part of today’s festivities, students from Clinton Middle School in Chelsea joined us to toss native plant seeds onto the landscape of the High Line at the Rail Yards. 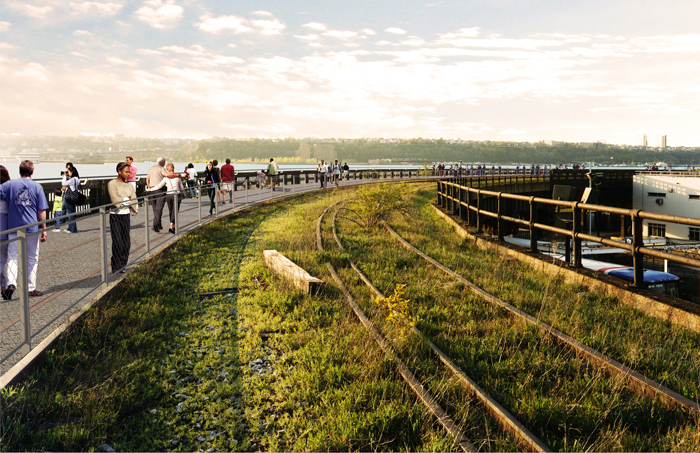 This landscape, which grew up between the tracks when the High Line’s freight trains stopped running in the 1980s, will be partially preserved in the new park. 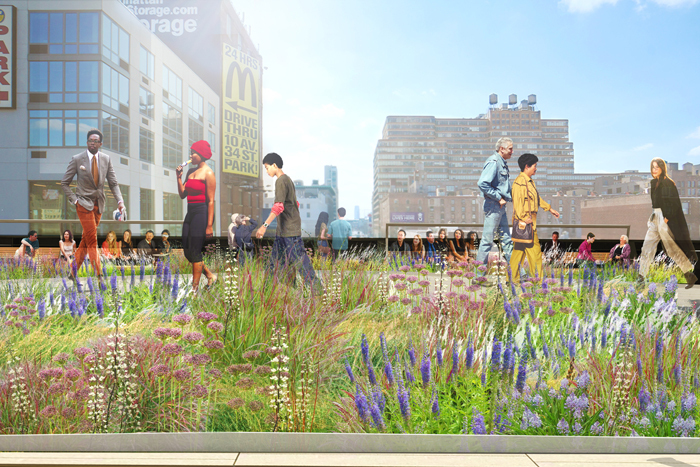 As part of the design for the first phase, we are building an interim walkway through the original, self-seeded wildflowers and grasses that inspired our community to save the High Line from demolition and to transform it into public open space. 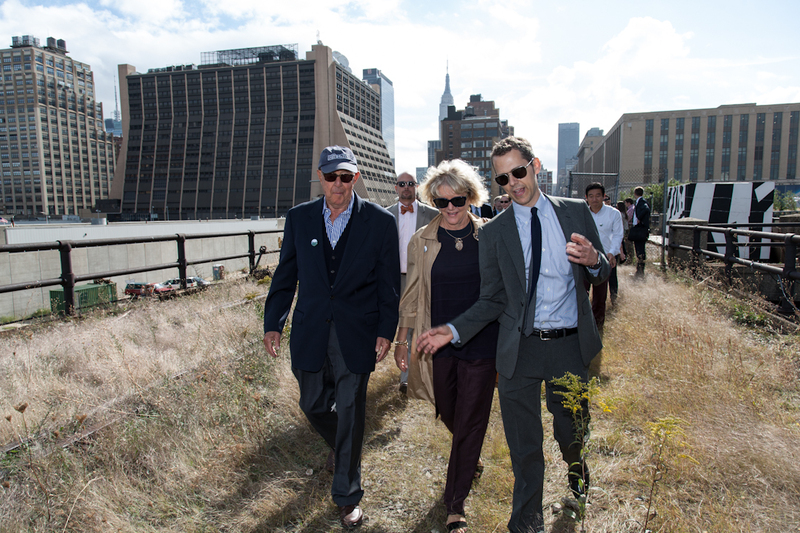 Since its founding in 1999, Friends of the High Line has worked with government officials, supporters, community leaders, and friends to advocate for the preservation and transformation of the entire High Line, including this last half-mile at the rail yards. Today’s events bring us one step closer toward realizing what once seemed like an impossible dream: opening the entire mile-and-a-half of the High Line to the public. Many people in both the public and private sectors have helped make this historic moment possible. 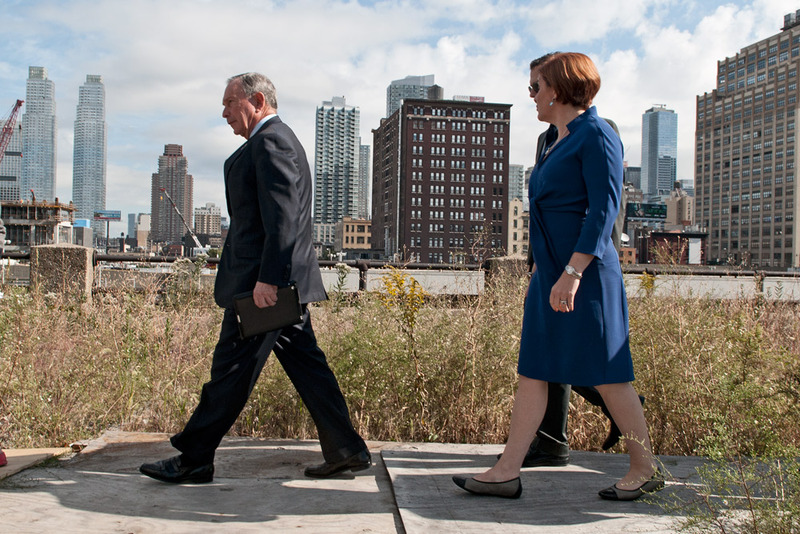 We would like to thank our elected officials Mayor Michael Bloomberg; the New York City Council, under the leadership of Speaker Christine Quinn and her predecessor Gifford Miller; Manhattan Borough President Scott Stringer; U.S. Senators Charles Schumer and Kirsten Gillibrand, as well as our former Senator and current Secretary of State Hillary Clinton; Congressman Jerrold Nadler; Governor Andrew Cuomo; State Senator Tom Duane; State Assembly Members Richard Gottfried and Deborah Glick; our partners at Manhattan Community Boards 2 and 4; our visionary philanthropic leaders Diane von Furstenberg and Barry Diller, The Tiffany & Co. Foundation, and Donald Pels and Wendy Keys; Related Companies, Oxford Properties Group, Coach, and the Metropolitan Transportation Authority for its partnership in opening the High Line’s final section; CSX Transportation, Inc. for donating the High Line structure to the City of New York; our Board Chair John Alschuler and Board members, and finally, the hundreds of neighbors, volunteers like you who have dedicated time, energy, and support to our efforts to save the entire High Line and transform it into an extraordinary public park. We are so thrilled to celebrate this moment today. 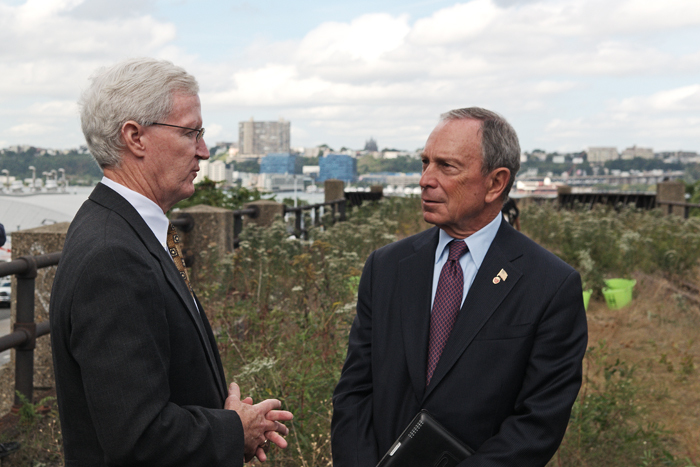 However, we still have more work to do to fund the estimated total $90 million cost of building the High Line at the Rail Yards. 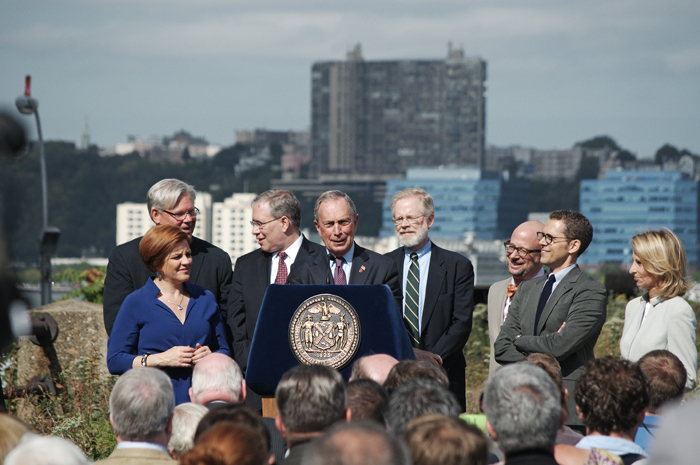 We are grateful to the Bloomberg administration and New York City Council for contributing $10 million toward capital construction, as well as Related Companies and Oxford Properties Group for committing to provide $27.8 million in funding toward the capital construction of the High Line at the Rail Yards, as well as additional funding for the park’s ongoing maintenance, as part of their development of Hudson Yards. 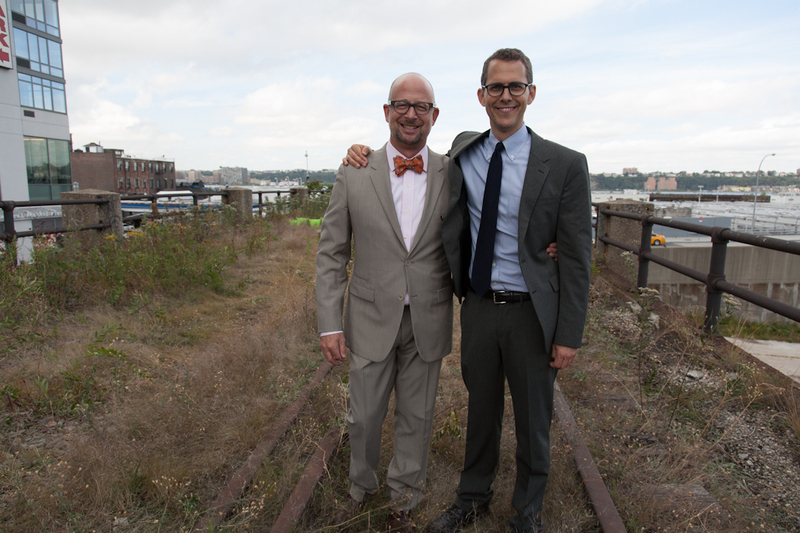 Friends of the High Line has committed to raise $20 million in funding from philanthropic sources to support the cost of building the High Line at the Rail Yards. 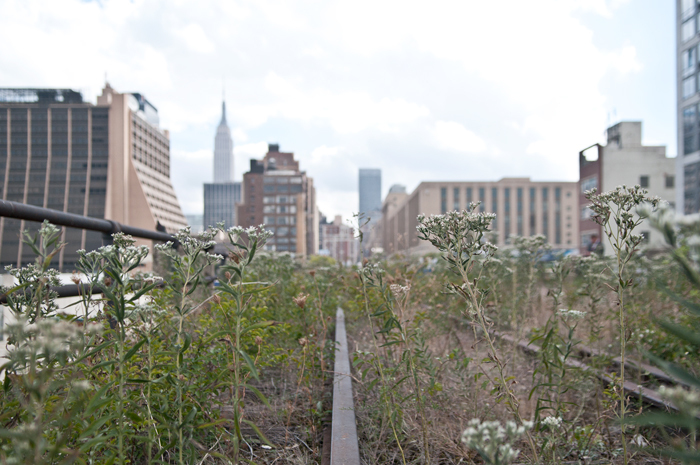 We’ll need your continued support as we move forward with construction and continue our efforts to build an endowment for the High Line’s future. Construction Phasing Map. 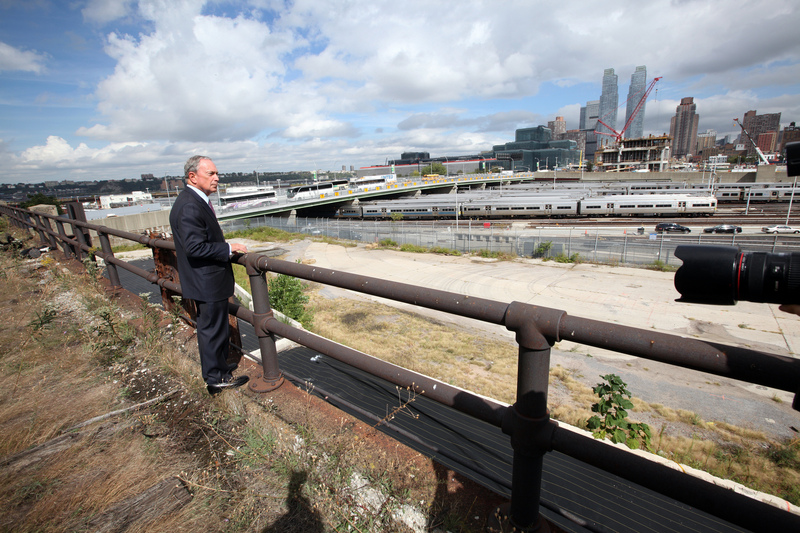 The High Line at the Rail Yards will be constructed in phases. Phase 1 will extend from the end of Section 2 of the High Line (currently open to the public) all the way to West 34th Street. 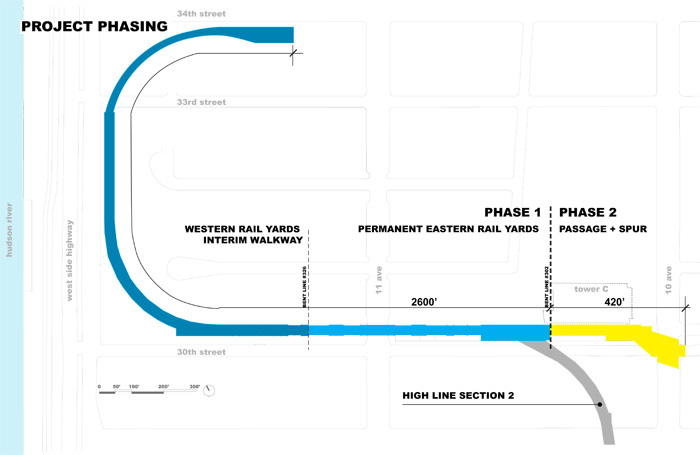 Phase 2 will cover the area to the east of Section 2, including the 10th Avenue Spur. Phase 1 will include two different types of construction: over the Eastern Rail Yards, the High Line structure will undergo a full capital rehabilitation, and the park will be fully built out to a level similar to the previous sections; over the Western Rail Yards, the work will be limited to an interim walkway installed in the existing landscape that will allow the public to experience the High Line’s remarkable self-seeded wildflowers and grasses. This area will be fully built out in a future Phase 3. Context Map. 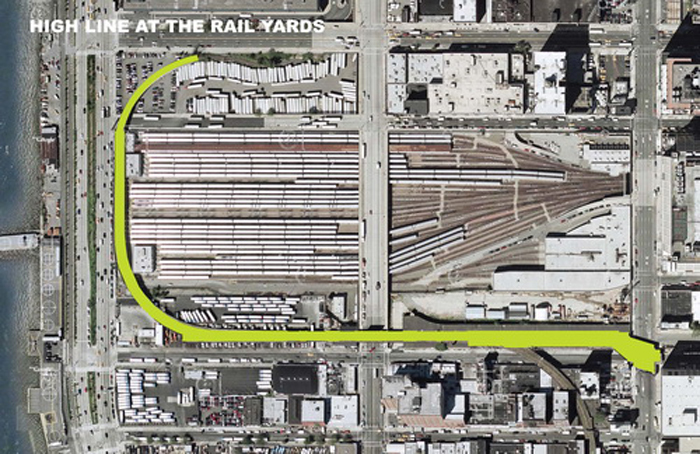 Highlighted above in green, the rail yards section of the High Line runs for one-half mile north of the portion of the High Line that is currently open as public space. 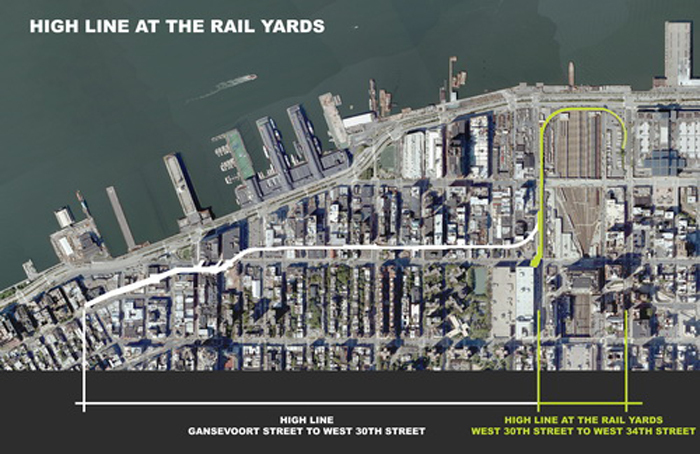 The rail yards section is located between West 30th and West 34th Streets to the south and north, and 10th and 12th Avenues from the east and west. Context Map Detail. The High Line at the Rail Yards wraps around the West Side Yards, an active train yard for Long Island Rail Road. The area over the tracks has been leased by the Metropolitan Transportation Authority (MTA) to The Related Companies to build a platform over the tracks and create the new Hudson Yards mixed-use development above. The rail yards section will extend the High Line’s distinct design vocabulary established south of West 30th Street, evoking the High Line’s history as an active freight rail line. Here, planting beds featuring Piet Oudolf’s naturalistic landscape border a pathway embedded with the High Line’s original tracks, inviting visitors to walk along rails where trains once traveled. Along the High Line that is currently open to the public, the park’s “peel-up” benches are an integral part of the landscape design, rising organically from the planks of the walkway. In the rail yards section of the High Line, the “peel-up” benches will evolve into a new family of design elements to create more seating, picnic areas, play features, and more. 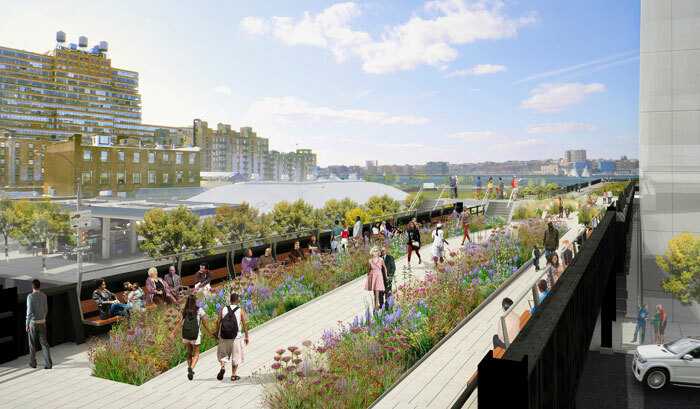 As the High Line travels over 11th Avenue, the primary pathway will slowly ramp up, creating an elevated catwalk that will raise visitors approximately two feet above the High Line level to take in panoramic views of the cityscape and Hudson River. Lush display gardens on either side of the catwalk will separate the primary pathway from the more intimate linear bench seating running along the railing on either side of the bridge. 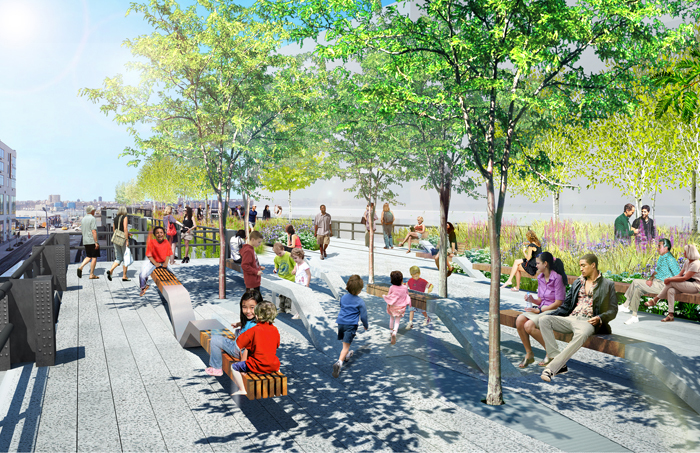 Park visitors seated on the 11th Avenue Bridge will have a dramatic view of the public promenade unfolding before them, framed by lush plantings in the foreground and the City skyline beyond. 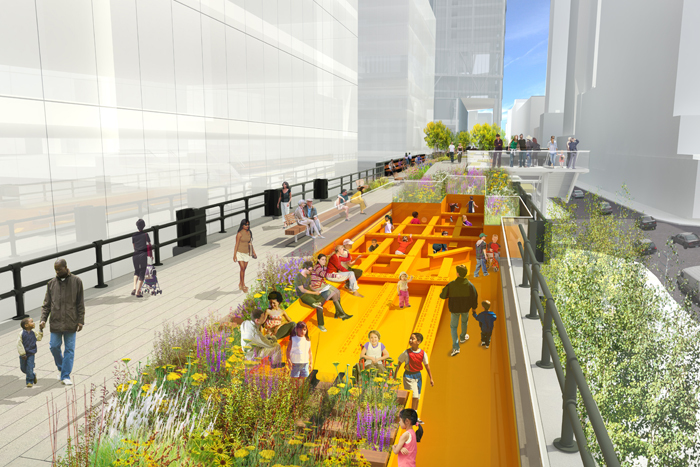 The third and final section of the High Line will feature a dedicated area for kids and families. Just west of 11th Avenue, the railway’s concrete deck will be removed, revealing the framework of the High Line’s original beams and girders, covered with a thick rubber safety coating, and transformed into a unique feature for kids to explore the High Line in a new way. 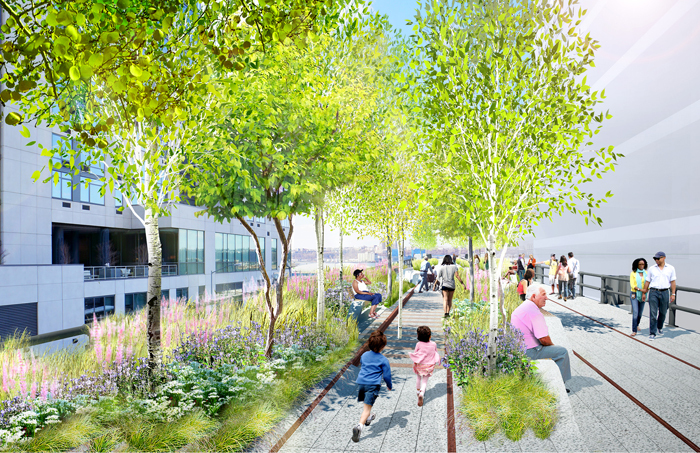 While western portion of the rail yards will feature an interim solution – a simple path through the existing self-seeded landscape – that will allow the public to directly experience the wildflowers and grasses that grew between the tracks once travelled by the freight trains. Here, the walkway winds along the curve of the High Line at West 30th Street and 12th Avenue, and provides visitors a new opportunity to experience the original railroad tracks and Hudson River. Join the High Line on Facebook, follow @highlinenyc on Twitter, and sign up for our enews to receive updates on construction at the High Line at the Rail Yards.